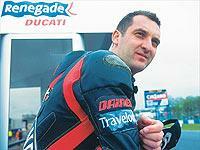 Michael Rutter reckons he’s the man to challenge Sean Emmett and Steve Hislop for the 2002 MCN British Superbike title. For more on Michal Rutter’s challenge and Niall Mackenzie’s Knockhill predictions, don’t miss the latest issue of MCN – out Wednesday, July 3. The Renegade Ducati star is on a high after his maiden double win at Rockingham – a result which has brought him to with 34 points of series leader Hislop. Hislop’s on 246 points – 13 ahead of second placed man Emmett. But Rutter reckons the top two are too focussed on each other and that will play into his hands. He told MCN: " They are putting themselves under huge pressure because they’re so close in the championship and so worried about what the other is doing.
" Now they have to look over their shoulders - and know that I am closing in. " The series heads North of the Border to Hislop’s home round of Knockhill on July 7.